Skylight Press is proud to present an all new ‘Expanded Edition’ that includes additional articles, transcripts of talks given at various conferences (including the well known Hawkwood sessions), chapters contributed to the books of various colleagues, and short pieces selected from Gareth Knight’s own magazine, Quadriga, previously only published to students. These new additions will add new insights, particularly with regard to the faery tradition within the grail legends, which has taken on an increasing importance in recent years. These new sections include The Faery Tradition in Arthurian Legend and a new analysis of Chrétien de Troyes: The First Arthurian Romancer. Additionally, an old manuscript has come to light on Sir Gareth: the Quest of a Round Table Knight, resurrected from a private lecture given in Paris in 1987. 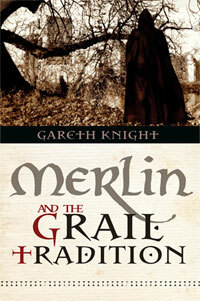 This new expanded collection of thirteen pieces therefore represents Gareth Knight’s eclectic pursuit of the Merlin and Grail mysteries over a period of more than thirty years. Merlin and the Grail Tradition is available from various retail outlets such as Amazon, or direct from the Skylight Press website. This entry was posted in Esoteric, Essays, New books, Recommended reads and tagged archetype, Arthurian Legends, British History, Brythonic Literature, celtic history, Celtic Mythology, chrétien de troyes, Dion Fortune, Esoteric. Western Mysteries, Faery Lore, faery tradition, Gareth Knight, grail legends, Grail Tradition, Hawkwood, Inklings, Jungian theory, Lectures, Magic, Malory, Masonic, Merlin, merlin and the grail tradition, Occult, qabala, quest of the holy grail, ritual, spirituality, tarot, Western Mystery Tradition. Bookmark the permalink.